Katherine Balatbat started her legal career in the New York office of Skadden, Arps, Slate, Meagher & Flom LLP. She worked in Skadden’s New York and Los Angeles offices, and in both the corporate and the litigation departments. She worked at Skadden from 1996 until 2003 before joining Valle Makoff. 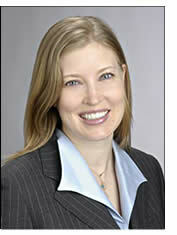 Ms. Balatbat has a broad litigation practice, representing both plaintiffs and defendants in federal and state courts. She has represented clients in matters involving antitrust, communications, employment, and entertainment law as well as other complex business litigation. With Mr. Valle, Ms. Balatbat has obtained multi-million dollar jury verdicts for her clients and favorable decisions in arbitration. She also has obtained seven-figure settlements in a suit involving wrongful termination and in a suit involving theft of an idea. In addition to her litigation experience, Ms. Balatbat has transactional experience. She has worked on a variety of corporate transactions, including private placements, public offerings, leveraged buyouts and mergers and acquisitions. In 2000, Ms. Balatbat received a Special Commendation from the Governor of California and a Certificate of Recognition from the California Legislature. Ms. Balatbat has dedicated many hours to public service and pro bono legal work for individuals as well as non-profit organizations both at home and overseas. Ms. Balatbat earned her law degree in 1996 from Columbia University School of Law, where she was a Harlan Fiske Stone Scholar. She received a Bachelor of Arts degree with honors in political science from Northwestern University in 1991. Mrs. Balatbat is admitted to the State Bars of California and New York.